Gerry Piaskowski retired in June of 2001 as Director of Design at DaimlerChrysler. He worked in various Exterior and Interior assignments within the Design Studios for 39 years. He served in the Army Reserve for 6 years as a cook after earning a B.F.A. in Industrial Design from Wayne State University. Gerry was head of the Truck Studio which created the first Dodge Durango than later the second generation Durango. At another point in his career his Soft Trim Studio designed all the seats and doors for all of the Chrysler products. At Wayne State the Industrial Design curriculum required four crafts classes. This is where he generated an interest in metalwork. He began working in silver and copper then moved on to include gold in his products. In the early years most of his clients were his coworkers. Now his client base is formed by “word of mouth.” He has clients in many states and even Paris and England. 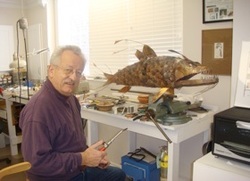 In retirement he has enjoyed trying new techniques such as wire weaving, beading and experimenting with Fimo clay and PMC (precious metal clay). Recently he began creating plaques made of found objects, aluminum, brass and copper. This led to the creation of fish sculptures. The base is wood with either galvanize metal, aluminum, copper and found objects making up the surface.